Rod Serling was the presenter and the only regular cast member. 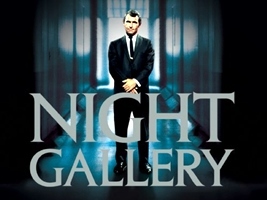 Patterned after the highly successful Twilight Zone, Rod Serling gave the anthology format another go with Night Gallery. 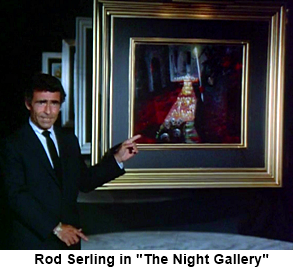 Where Twilight Zone dealt more with pure science fiction, Night Gallery delved more into the horror genre. The show’s concept was a unique one: Before each story began, Serling introduced the tale with an abstract yet fitting painting, an illustrated picture that captured the segment’s essence. All of these painting were done by Tom Wright. Occasionally there would be a macabre sculpture instead of a painting, these were done by Logan Elston and Phil Vanderlei. Rod Serling was the host and creator and he wrote quite a few of the segments. WhenTwilight Zone ended he immediately began making plans to recreate it in a little more modern context. To make writing and filming a little easier (and less expensive) the new show would be broken up into multiple segments per hour show. 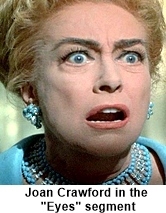 When the series was reduced to one half hour in season three, only two segments would be aired.